We are a professional, friendly and reliable dog walking service based in York, North Yorkshire. We pride ourselves on our high levels of care and attention in keeping your best friends happy and exercised. Ben has fully comprehensive dog walkers insurance. This includes liability and public liability cover for all animals in his care. Ben has attended Specialist Animal First Aid training and is qualified to administer care in an emergency situation. The Whistle service is based around building a trusting bond with you and your dog through personal and regular contact. I have lived in Yorkshire for around 10 years, settling in York 5 years ago. I've always been passionate about animals and drawn to the loyalty and affection of dogs in particular. I started Whistle after leaving my corporate job in IT, to pursue my dream of combining my love for the outdoors with my passion of dogs. 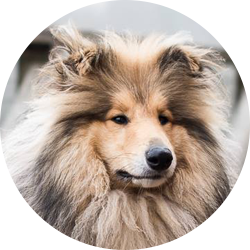 I'm a friendly and energetic 4 year old rough collie. I've always been keen to make new friends and couldn't be happier now that I get to spend most of my time socializing and playing with new canine companions every day.